"It's awesome to see the excitement of axe throwing spread to new cities and it's been fantastic to watch the sport's exposure online!" Says James Anderson, owner of Forged Axe Throwing. WHISTLER, BC, August 30, 2017 /24-7PressRelease/ -- From single to dual axes, and couples to groups, axe throwing is an activity on the rise in the Sea to Sky Corridor. Function Junction-based Forged Axe Throwing has expanded from their current location with four axe throwing cages to offer a mobile unit, which premiered during the destination's popular Tough Mudder. In addition, the team at Forged has had their mobile unit in Squamish for a number of events this summer including the Squamish Beer Festival in partnership with the Squamish Days Loggers Sports Festival. "Every day we're seeing a new angle for a throwing shot pop up in our Instagram feed," says James Anderson, owner of Forged Axe Throwing. "It's awesome to see the excitement spread to new cities and it's been fantastic to watch the sport's exposure online!" "Squamish is definitely ready for a dedicated axe throwing venue and we're super excited to welcome BATL to the region," says Anderson. 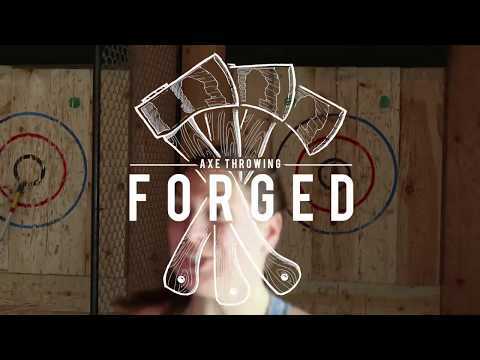 To learn more about Forged Axe Throwing, call Forged at 778-770-2240 or email hatchet@forgedaxe.ca. Our goal at Forged is to make sure everyone is having the best time possible throwing axes!